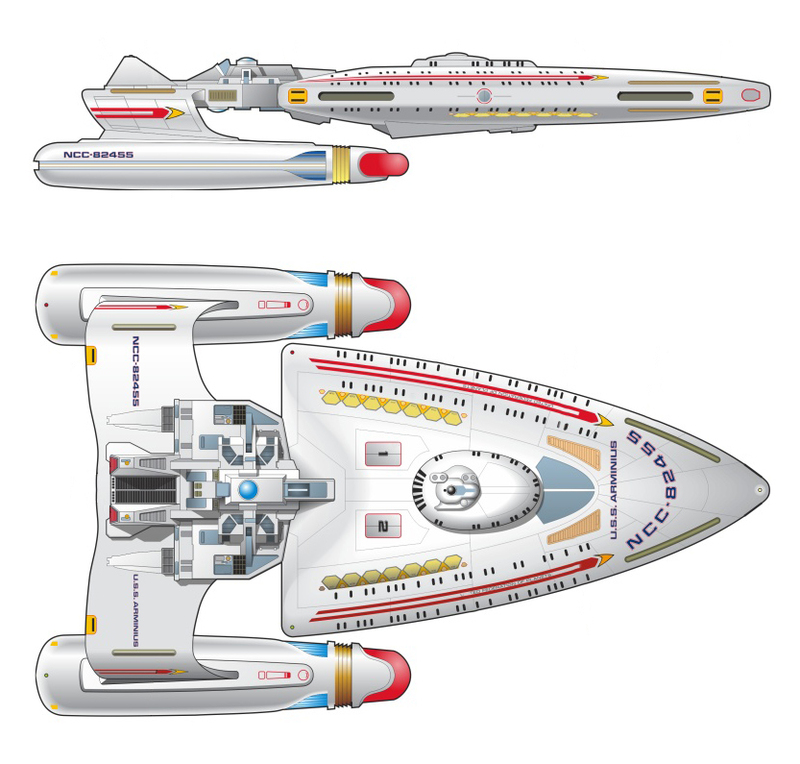 Designed in the late 2340’s and eventually fielded in the early 2350’s, the Arminius was one of the most unique multi-purpose designs to come from the M’Yengh Design Bureau of Cait. Originally designed as a courier, Star Fleet soon re-purposed the initial design to serve as a “police” ship, designed to operate along non-military boarders where pirates and brigands were still a significant threat. The design itself underwent several changes during its initial construction phase. At it’s earliest conception, the Ariminus was intended to fulfill a pure corvette role. However, designers soon planned to add additional troops and boarding parties to tackle more dangerous targets. The vessel changed from it’s customs enforcement role to a gunboat roll in late 2438. However, Star Fleet Merchant Marine Command requested that it’s police role be restored just as tooling began. The ever resourceful and multi-tasking Catians eventually settled on the multi-purpose design that was fielded in 2354. This final design included a standard 14 man customs enforcement unit, but also billeted a specialized 25 man security force. This special Star Fleet Security Unit was trained in both marine style boarding tactics and planetary police enforcement tactics. This gave the Ariminus tremendous flexibility to serve as an interdiction craft, pirate hunter and customs vessel at the same time. To further enhance these abilities, designers included a full Federation court and it’s support personnel. Representatives from the Office of Legislative Affairs and Office of Judge Advocate General had full legal teams assigned to these vessels. Representative teams from Star Fleet Material Command and Star Fleet Intelligence were also present. 12 special holding cells were installed in addition to the standard Federation security holding cells. These unique “jails” could house one to three suspects when necessary, providing access by legal personnel, limited computer database access, specialized environmental controls and enhanced security systems. Catian designers boasted that only command ships had better on-board legal capabilities. In it’s corvette role, the Ariminus was a successful combat platform. Highly maneuverable and well armed, the moderately sized vessel could easily engage multiple light pirate vessels as well as more powerful command ships common to both the Orion Syndicate and the Naussican Pirate Cartells. When operating in areas were large enemy vessels were likely to be encounters, multiple Ariminus class ships were group together. Some were also assigned as part of larger task-forces where their unique abilities might be needed. The Ariminus was produced at the Cait shipyards as a rate of 4 per year. Of the 64 produced, 59 are still in active service. 3 were lost during the Dominion War, 1 was scrapped after engaging Orion pirates and 1 has been sold to the Cait government. All Mk I’s were converted to Mk II’s by 2282. Power Units Available – 18 ea. 20 ea. Power Units Available – 15 ea. 18 ea.